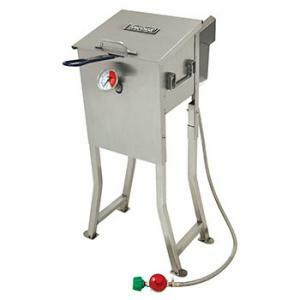 Basket Size: 7.5" x 11" x 3.5"
A newer, smaller, more efficient version of the classic Bayou Fryer! Sturdy, restaurant-quality durability and performance. V-Bottom Design keeps base oil temperature cooler than at the surface so batter does not scorch. Oil stays clean and lasts longer. Includes a Stainless Steel Basket with Cool Touch Handle.